For those of you who have heard of my latest book, The Obesity Conspiracy, or are just mildly interested in your own health, check out this article on Vox where Julia Belluz interviews nutrition journalist Gary Taubes, author of the recently published The Case Against Sugar, about, well, take a guess. His basic proposition is that research on the causes of the obesity and diabetes epidemics should first try to rule out sugar as the primary or biggest cause, and until it does, sugar should be considered as unhealthy or worse than tobacco or alcohol. Which is a problem since Western eaters are wolfing down sugar at most meals in grotesque amounts that they probably don’t realize. Let’s not forget the horrendous explosion of American obesity in the last half century. 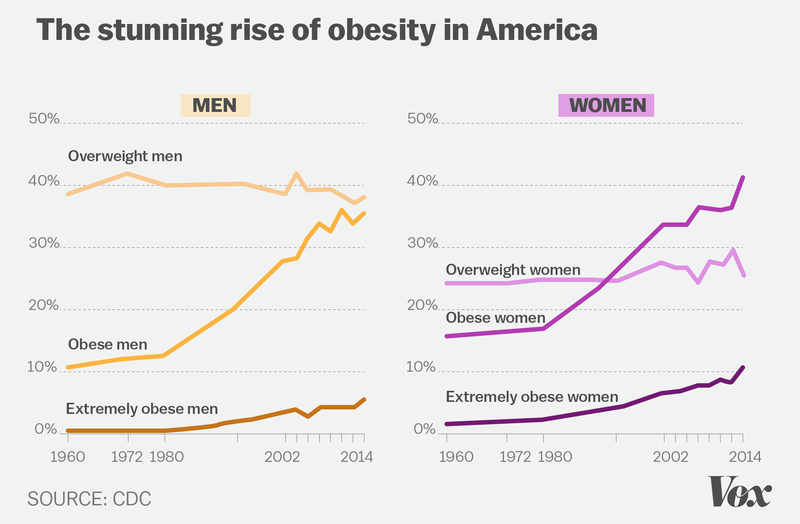 Note that the proportion of overweight men and women hasn’t decreased as the ranks of the obese have skyrocketed. That means those who would have been overweight in earlier years became obese, and those who were normal weight became overweight. Taubes is not just a controversial nutrition journalist, he’s tried to organize and fund sound nutrition science. Nutrition research is a whole other difficult issue, complicated by self-interest, poor methodology, sneaky corporate financing, excessive shoulder-shrugging, and research findings that often fall prey to hyperactive-press coverage-disorder. I think Elaine Cassano and Gary would probably be colleagues if Elaine wasn’t just a character in my book. I have to give Taubes credit that he allows for his theory to be wrong, which seems to be a rare things these days in heated debates. For what it’s worth, I have been conducting my own crusade against consuming sugar. I have fought it back into a corner where it sneaks in via baked beans, breads, and the very occasional soda (that night at Time Market in Tucson, for example). This is partly to make up for some truly ridiculous overconsumption as a kid. I could make a bowl of Rice Krispies look like Mount Everest with the help of two or so tablespoons of sugar, every morning. Not to mention the Hostess cupcakes, root beer, chocolate, and high-test (double the powder) Country Time lemonade. Sugar is bad, m’kay?